I am always impressed by those who ‘walk their talk’ and entrepreneur and founder of The Aromatree Company (formally known as Feet Treets) Kirsten Luff – is a wonderful embodiment of her ‘brand’. Not only does she look amazing; her lifestyle totally embodies her belief in healthy living and the positive benefits of continually improving our mind, body and soul. When Kirsten and I met a couple of years ago during an exhibition for her natural and therapeutic Aromatree foot cream range, I was bowled over by her passion and knowledge of her subject. Made by her own fair hands, Kirsten’s range is beautifully presented and it is clear to see how much love has gone into its creation. It is obvious by the way she presents herself and her products that she cares deeply about offering a quality product and a professional service to her clients. Kirsten has been a Complimentary Therapist for 16 years; practising therapies such as Reflexology, Aromatherapy, Reiki, Kinesiology, Psych-K, Hopi Ear Candles and various forms of Massage. When she offered me the opportunity to experience a reflexology session using some of her products, I jumped at the chance as a reflexology session with Kirsten is a real treat! After taking the requisite health notes and identifying the areas to work on, the session began with the selection of the most appropriate foot creams and I drifted off to the sounds of relaxing music, the aromas of essential oils and an amazingly soothing foot massage. As a Reiki Master Practioner, Kirsten is a powerful healer and I enjoyed an unexpected bonus when she proceeded to cleanse and balance my chakras. Kirsten often exceeds her client’s expectations by giving additional healing as part of their treatment – and as you would expect – they love her for it! I left the session clutching a gorgeous jute bag full of Feet Treets goodies and feeling so refreshed and restored that I almost danced out of the treatment room! Whether you are looking for a healing treatment, or just want to treat yourself or a loved one to some wonderfully healing foot creams, Kirsten Luff and her Aromatree products come fully tested and highly recommended! During consultations with her Kinesiology clients, Kirsten began muscle testing the cosmetics and creams they had been using on their bodies. She discovered that the majority of these didn’t test well and combined with an increase in environmental pollution, stress and often poor nutrition, the use of these products were adding to the negative effects of the environment and their poor lifestyle choices. Recognising the benefits to our wellbeing by the use of natural products, she began creating bespoke products for her aromatherapy clients using essential oils and base creams made from products carefully sourced from respectable companies that she trusted. Keen to explore new ways of helping her clients and to further develop her product range, Kirsten decided to train in Scotland to learn the process of making creams and other base products from scratch using quality, natural and organic raw ingredients. Completing her training, she began using Kinesiology to test her clients with a selection of raw ingredients; particularly preservatives. These included parabens (a mix of various parabens – excluding the controversial butyl paraben), Preservative K and Sodium Benzoate (which at the time was the most natural preservative around). The results were quite amazing with everyone testing well for the Parabens and no-one testing well for the Sodium Benzoate, indicating that natural does not always mean safe! 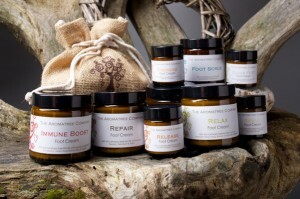 Using the results of the testing, Kirsten created A UNIQUE RANGE of Aromatherapy Therapeutic Foot Creams to use within her own Reflexology practice providing another dimension to her work. A treatment within a treatment! Each of the creams went through mandatory laboratory testing by The Cosmetics Lab Ltd in Horsham and consisted of a safety test and a challenge test. The creams were also tested using Kinesiology to ensure there were no detrimental effects on the body’s system. They were found to work systemically with the body thereby further enhancing the health benefits of Kirsten’s treatments. Word soon began to spread as other therapists began using the products in their own treatments and trade enquiries are coming in thick and fast. The creams are perfect for use professionally as they do not absorb too quickly and are not too greasy. Feedback from other therapists has been extremely positive and with 7 different therapeutic creams to choose from, the treatments can be tailored for the individual. Therapists who are not aromatherapy trained can also use the products safely. Kirsten is generously offering a 20% Discount off the entire AROMATREE product range for all Naked Dragon fans! Please call her on the number below for further details. Janey Lee Grace – How to Look Good: Naturally! I’m delighted to hear that you love using Kirstan’s products as much as I do. Trouble is, they are becoming so popular that I have to join the queue to obtain new supplies! Love your comments about your father-in-law and mother-in-law bonding as result of using the creams. I don’t think Kirstan had considered her range to have the power to improve relationships. It just goes to show what happens when you begin to spread the LOVE! Kirstan has just developed a new holistic pedicure which is going down a storm with the therapists in the local spas and I am looking forward to experiencing a treatment for myself next week. 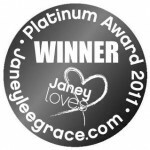 Many congratulations Kirsten for winning your Platinum Award from Janey Lee Grace – as announced today! These creams are amazing, they smell wonderful, they really help dry skin whilst making your skin feel supple and nice. Kirsten is an amazing women who must have spent hours concocting potions to get the mix right! Very talented lady and very nice to meet. As a reflexologist I work at a stroke clinc and the creams really help the patients feet feel really soft, many have since purchased the cream. My niece suffers bouts of acne being a teenager and the relax cream really helps keep her spots at bay.